CENTRAL LAKEVIEW — When Mike and Meredith have their baby this September, they'll miss out on that happy trip home from the hospital. After a fire early Monday left their building water-logged and burnt, the Lakeview family is without a home to go to. "We're going to be raising him for the first few months of his life somewhere other than his home, which is not ideal. But luckily, we're safe, and he's still kicking," Mike told DNAinfo Chicago. 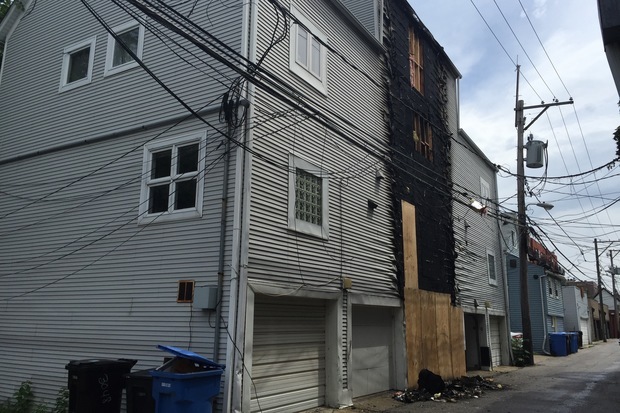 Mike, 30, and his wife woke up around 4 a.m. Monday to the beeping of a fire detector in the fire escape that separates their home from neighbor Simon. The residents asked their names not be used because they don't know the cause of the fire and whether it was sparked with malicious intentions. The couple assumed something in the alley directly behind their 3046 N. Sheffield Ave. property had caught fire and went downstairs to investigate. "When we opened up the garage, that's when we saw the whole side of the building on fire. That was actually very shocking, and we both kind of screamed," Mike said. Within minutes, firefighters were on scene, and the fire was out by 4:15 a.m.
"The firefighters did a fantastic job putting it out. It could have been a lot worse. But most of the damage internally is from the water and smoke," Simon said. Mike said he was struck by how silent a roaring fire could be. "When there's a fire on TV shows, you can hear the sirens, and you assume it's this really loud thing. But it was literally silent, basically a giant camp fire, and you can't hear anything," Mike told DNAinfo Chicago. 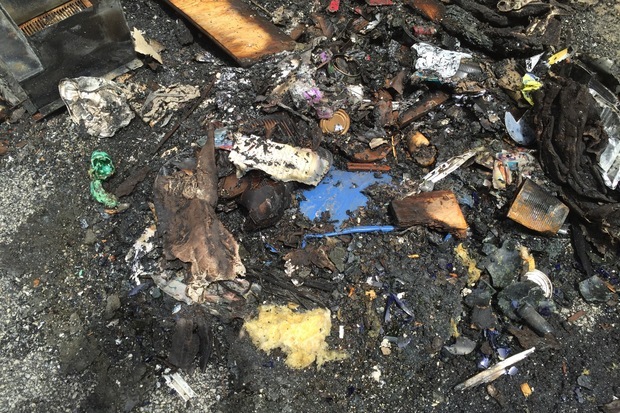 Both Simon and Mike said they didn't know what caused the fire, although it was possible the flames sparked in the trash and recycling bins left against the building. 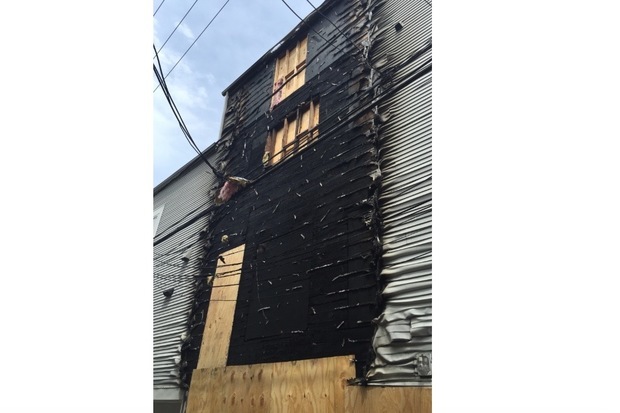 "The [firefighter] we spoke to said it's not uncommon to see fires start in alleyways from cigarettes and things like that, so no one can be conclusive," Simon said. Although the fire occurred very near where two suspicious fires were set late last year, both men said that didn't seem to be the case this time. "No one [from the fire department] has mentioned that, and I think if they were worried about that, they probably would have told us. My guess is they can't rule it out, but there's nothing to believe it would be," Simon said. The Chicago Fire and Police departments did not return requests for information on the fire. Since Monday morning, the three have been meeting with insurance agents and assessing the damages to their homes and belongings. With an out-of-town baby shower coming up, gifts that were already sent to Chicago have been ruined, Mike said. Mike and Meredith had been working on the nursery the night before, but "most of that stuff is gone," he said. Luckily, the crib hadn't been assembled yet and will probably be spared. Both homes will be unlivable for about six months while the alley-facing wall is rebuilt. Still, Mike said his family will definitely be returning to Lakeview. "It's certainly an inconvenience, but in the grand scheme of things, the three of us are still safe. We love this neighborhood, and we fully intend to stay here to raise our family," he said.